Nothing says comfort food like the perfect meatloaf. Just the smell coming out of your oven lets you know you’ll soon be enjoying a meal that is as traditional as it comes and will warm not only your stomach, but your heart. For as long as I can remember, my mother’s meatloaf was right up there with the best meals she cooked at her house. Along with a side of potatoes, green beans, rolls and salad, you have the perfect meal – especially when you use Certified Hereford Beef. For the last few years, my daughter, Bethany, and I have been on a health kick and started the Whole30 lifestyle change that really made a huge difference in our eating habits and weight. The program’s main accolades are its ability to limit sugar and gluten, while you have no limits on healthy proteins like Certified Hereford Beef. As someone who has a serious sweet tooth and love of bread, this was a real life change, but made us both feel so much better and lose a few unwanted pounds. 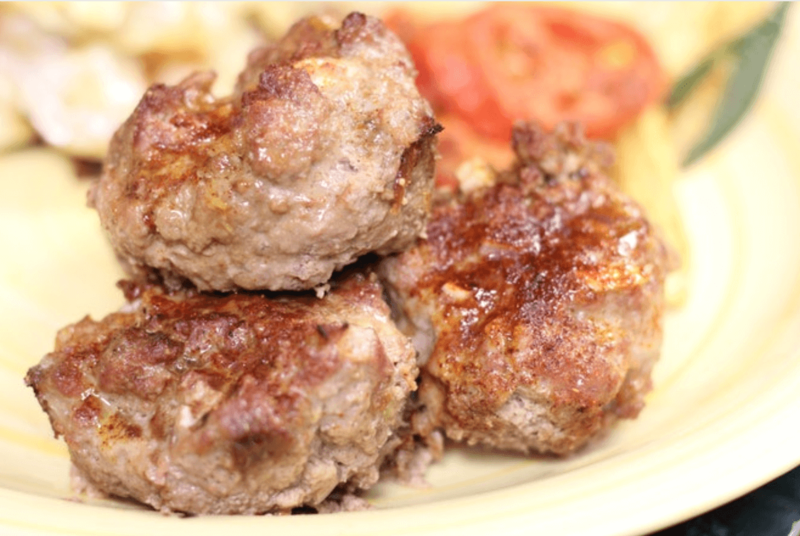 As Bethany and I created recipes for our Whole30 journey and posted them on The Ranch Kitchen site and blog, meatloaf was high on our list of meals to make Whole30 compliant. We fell in love with Almond Flour, which takes the place of the traditional white bread in this recipe, and a sugar free ketchup. Almond flour has a finer texture than traditional flour and can be used to make our redesigned Southwestern Meatloaf adapted from my mother’s traditional recipe. We baked these Southwestern Meatloaves in my muffin/cupcake tins to not only cook faster, but create a crust on the meatloaf that everyone loves. We also doubled the recipe during our Whole30 program since Bethany and I meal prepped a lot and tried to create breakfast, lunch and dinners that were ready to reheat and transport to work to ward off getting off-track on the program. 2. Mix ground beef with onions, green chilis, eggs and seasonings. Add BBQ sauce and mix well. 3. Add almond flour to the meat mixture and mix well. 5. Bake for 20-30 minutes, until meatloafs begin to brown on top. 6. In the last 5 minutes of cooking, baste tops of meatloafs with BBQ sauce and continue cooking. This meatloaf is great with Whole30 compliant smashed or mashed potatoes, asparagus, or a baked potato with clarified butter. Since the inspiration for this meatloaf came from my mother’s recipe, I’ve added in her recipe as well for those who choose to use white bread and traditional ketchup. I remember her making au gratin potatoes, a green salad and those little butter top rolls with this fabulous meal growing up! My mom, Virginia Young Goudarzi’s, meatloaf recipe that she learned from her high school’s homemaking class is still our favorite! I hope it will become yours! 1. Prepare bread crumbs. Chop onions and bell peppers. 2. Beat egg and milk, mixing into ground beef. 3. Add bread crumbs, onions, green bell pepper, salt, pepper, dry mustard, garlic powder, milk and ketchup to the ground beef mixture. 4. Lightly grease your loaf of pyrex dish with vegetable oil or non-stick cooking spray. 5. Place meatloaf in pan. Top with remaining ketchup as a glaze. 6. Base at 400 degrees Fahrenheit for 50 minutes in the oven. Cooks note: For faster meatloafs, you can bake these in muffin tins. Also, the aluminum foil that is non-stick is an excellent choice to line your pan in to cook the meatloaf with little to no cleanup. I like to double this recipe for my family and make a huge batch. Leftover meatloaf sandwiches are to die for! We hope you will enjoy these two variations on meatloaf as much as we do on our ranch. Certified Hereford Beef makes the meatloaf healthy from the lean protein and it’s absolutely delicious. Happy cooking and spring everyone. May the rains be only what we need and our farmers and ranchers throughout the midwest recover from the devastating floods and weather.